Hot on the heels of this week’s release of the Generations wave five, of War for Cybertron Cliffjumper, Skullgrin and Thunderwing, comes the highly anticipated debut of the Reveal the Shield subline/promotion. 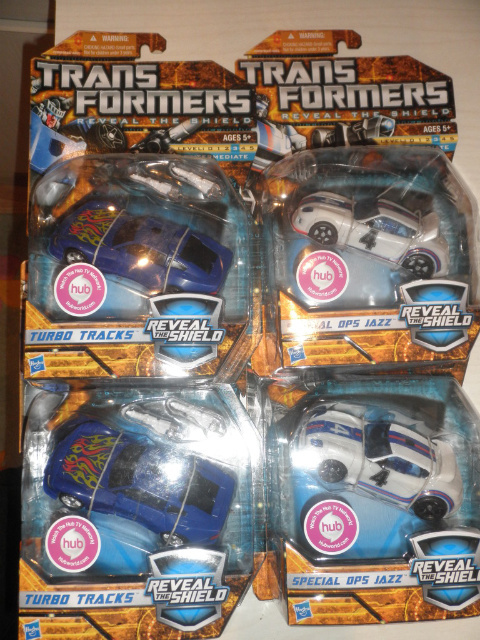 The first wave debuts the new molds Special Ops Jazz and Turbo Tracks along with remold Mindset and redeco Fallback! These were found by our own big hank at a Wal-Mart in Fort Lauderdale, Florida. Congrats, big hank, and happy hunting to the rest of us! I mean that is true, but they are still part of an assortment and come up that way in their system. For example, use that Jazz UPC @ a WalMart and they will be like "Yes we have them instock and the system shows we have 118 of them" Not all (if any) Jazzs. True story. Hm. That's changed since the last time I had them do that then. Granted, it has been a while. That's only true for Target's DPCI numbers. Places like Toys R Us and Walmart can actually look at distinct UPCs if you get an employee who is willing to. That won't matter if they're the same assortment as the Hunt for the Decepticon Deluxes. Well, now I have to give the drug stores some credit. Back at the end of RiD, I was happy to pay $15 at Eckerd for the only Storm Jet I ever saw in person. I wonder if those Prowls have smudgy paint still? Much to the relief of my better judgment, the Walgreens I went to today still had Brawn and original color Deluxe Ratchet. Heh. Heck, I've got two Rite-Aids near me. One has a peg full of Universe Galvatrons and the other has Universe Prowl. looks like Walgreens may be another possible location to find them. Thanks, that answers my next question. Walmart, out of all places! Looking at the speaker/gun combo makes me believe a Ricochet is likely. That combo reminds me of his target master gun. What is the UPC/SKU number? I have my receipt pic on the first post, blow it up and you can see it fine. Thanks to this thread, I now have my Tracks & Jazz. ive been on the hunt for jazz and tracks since ive none about them, this is great news, i just recently found blurr last week which is the newst fig ive got, back to hunting. Where did you find (store & location)? Technically, it's not mine yet. My sister in-law picked them up for me at a Walmart in Palm Beach, FL. Next weekend she will mail them to me with some Christmas gifts.